The flat grazing marshes of Romney, with large farms and famous sheep flocks, now adorned by a wind farm and bigger airport outside the old village of Lydd, give way to low shingle ridges decked with bushes as the road heads south to Dungeness. A mile or so on is the turn to the RSPB reserve, where birdwatching hides overlook flooded former gravel workings, before making the turn just before The Pilot Inn to the ness. The ness supports lines of well-spaced wooden houses, a smartly maintained lifeboat station, strings of small fishing boats, and assorted winches, storage boxes and other essentials along the ridge above the sea and an old and new lighthouse. The assemblage, open and unfenced, has a stark and rare beauty. 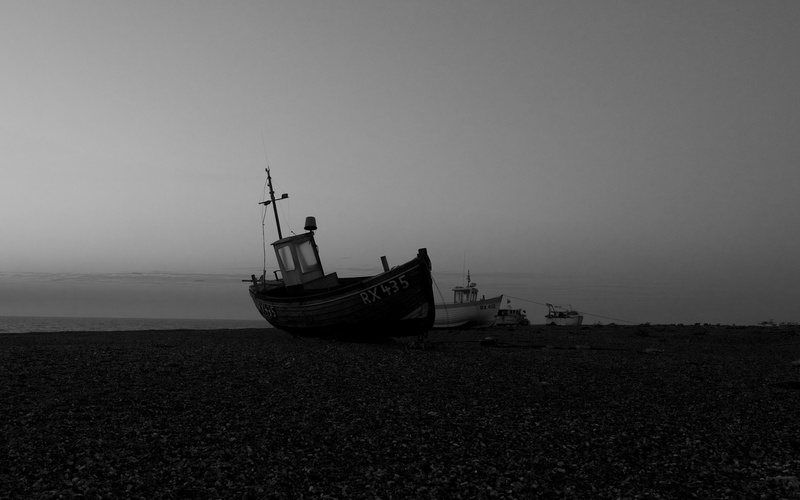 Fishing boats at dawn on the shingle above the sea. Lesser black-backed gulls moving along the shore. 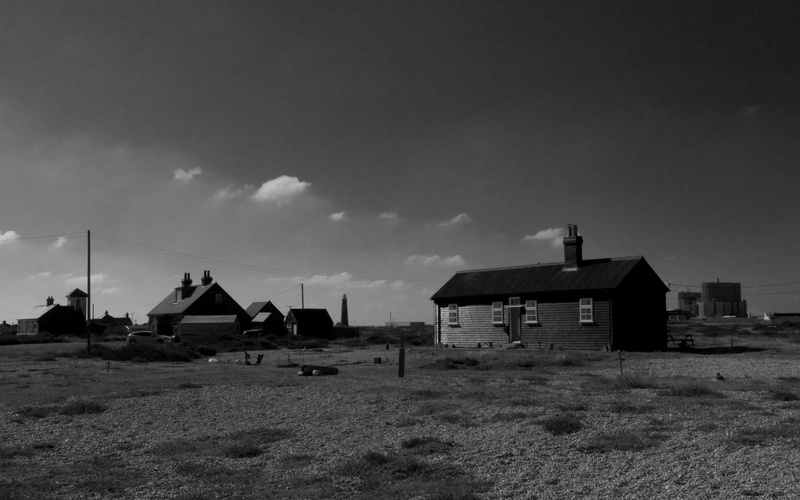 The almost empty shingle is however transformed by the presence of the nuclear power station which sits beyond the Britannia Inn and the old lighthouse with its distinctive Victorian housing. The two reactors sit like huge shoe-boxes and pylons and wires trail way to the north. It is an overpowering presence that subdues the endless landscape and kills the innocence of the wilderness. Mind you, the locals probably forget about the ugly sisters and the local economy enjoys the rock-steady employment. 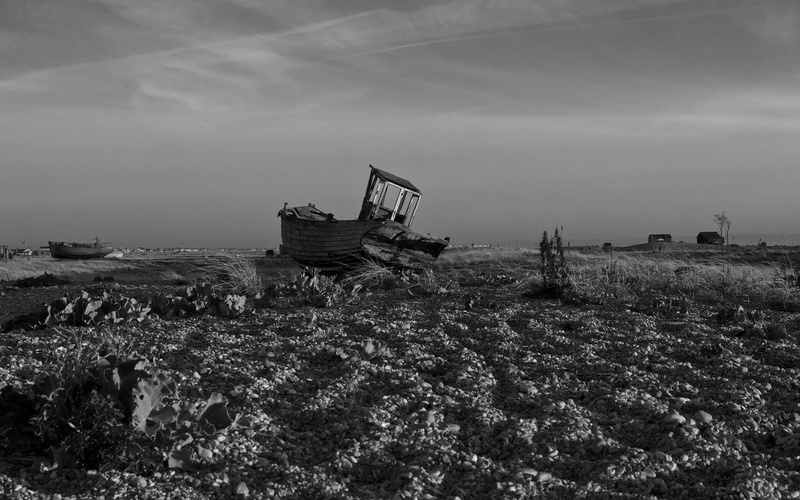 Dungeness A is the two shoe-boxes on the right and Dungeness B is the rounded tower in the distance. Wooden houses on the ness with nuclear power station behind. The local families, the most famous being the Tarts and Oilers, first came here to fish the rich seas at the start of the 20th Century. This was life on the edge; harsh and dangerous but it bred a close-knit community. Today, a handful of fishing families still set the rhythm of the place but incomers have smartened many of the shacks and infilled with new wooden buildings with sleek, minimalist exteriors and large windows facing south to the sea. 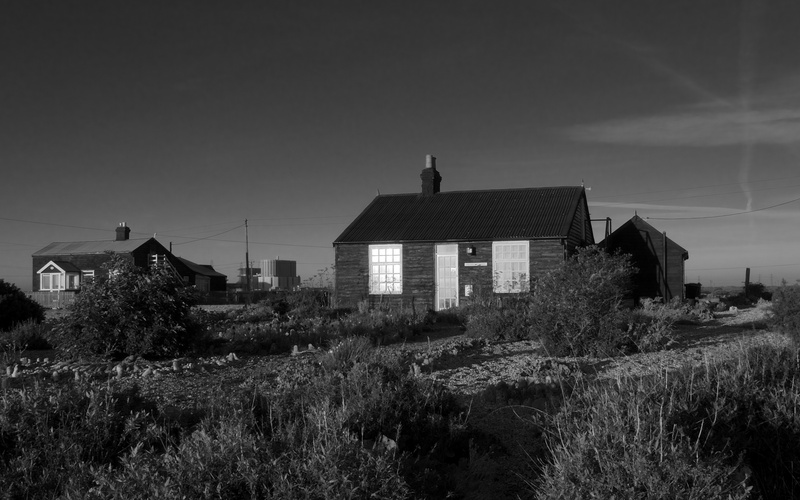 Old coastguard cottages house the bird observatory and birdwatchers arrive in numbers when a rare species lands. On the shore, there are always fishermen with their long casting rods, standing and staring at the sea or sheltering from the ceaseless wind in little bivouacs. A recently built wooden house. 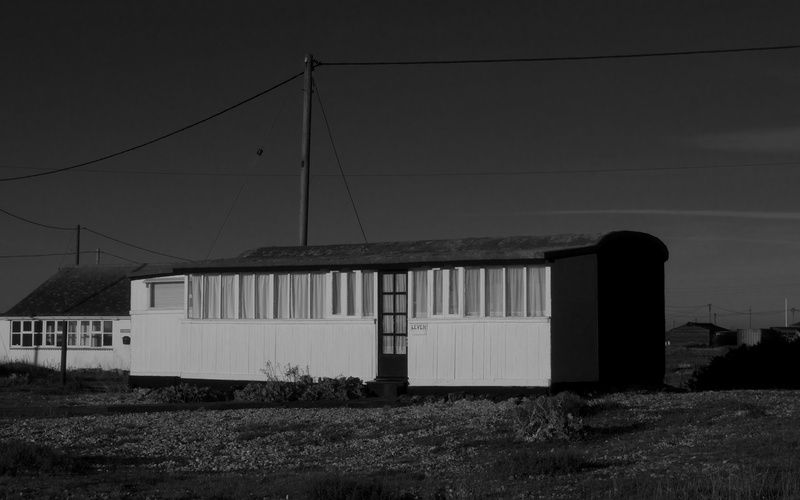 An old railway carriage dragged from the railhead to the shingle and subsequently enlarged. 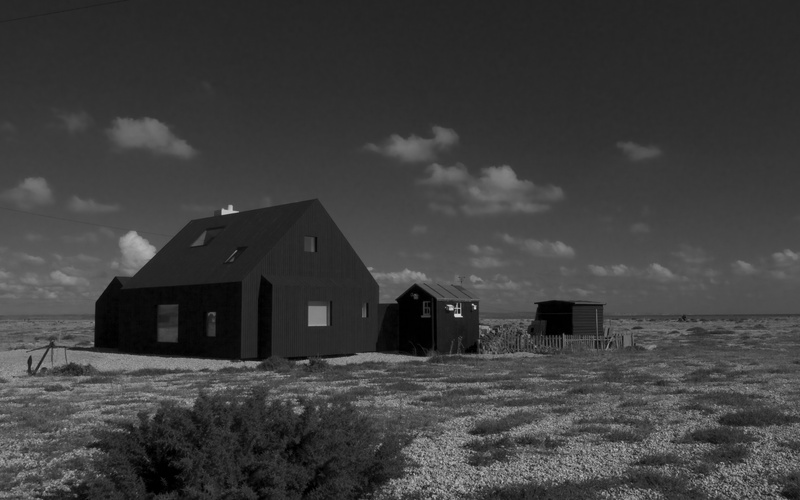 Derek Jarman lived at Prospect House and built a beautiful, shingle garden of plants and discarded wood and metal that brought, and continues to bring, Dungeness into the news. He perhaps inspired the new wave of second home owners that come to enjoy the wind-blown, shingle wilderness. 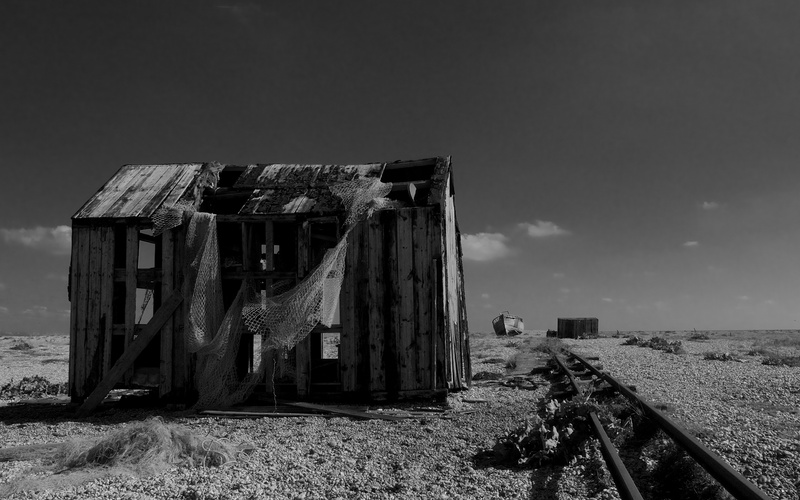 Dungeness today is a favourite weekend destination with fish to be bought from wayside cold stores and meals to be taken at the Britannia Inn or a train ride on the famous little steam railway that runs through Romney and Hythe to Dymchurch. 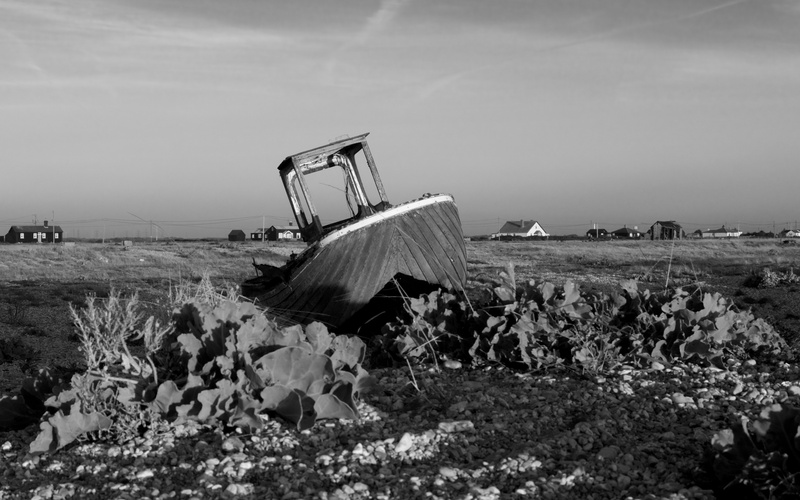 A long discarded fishing boat riding the wild waves of sea kale. 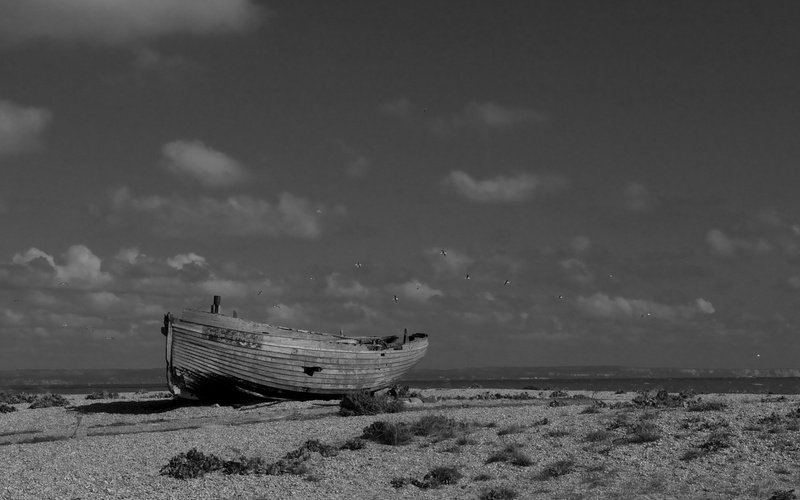 An old fishing boat settled in calmer waters. A typical image of delapidation; one much photographed by others. 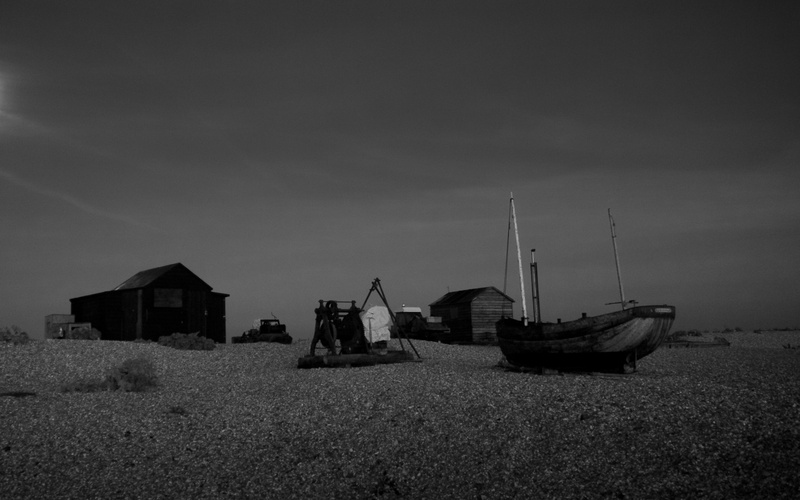 Fishing gear on the shingle at dawn. 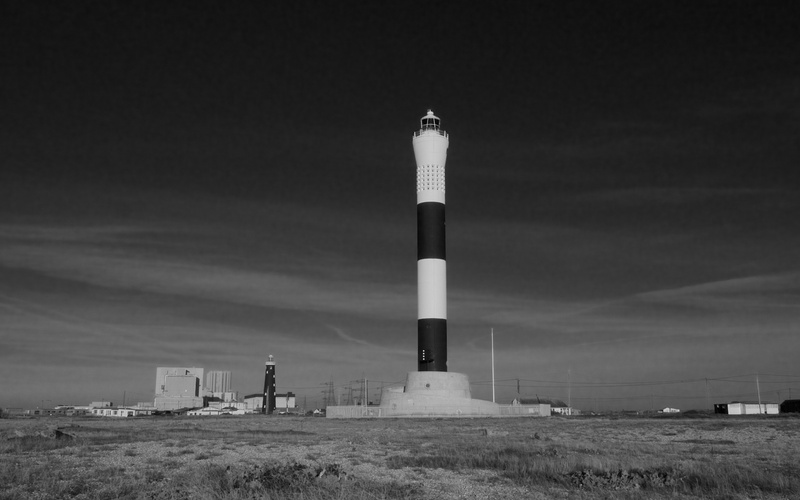 The new lighthouse with old lighthouse and nuclear power station behind.